Imagine a pair of bell-bottoms. A suede vest. A wide collar, strutting leather boots. Similarly, imagine sequins and elongated lashes. Pearls and sly eyes. If you can imagine this, you can begin to sense the spirits that inspired the newest record from Seattle soul and funk group, The True Loves. Their album, Famous Last Words, which has quickly found a regular home on our airwaves, is a dreamscape of quick hits and neon lights meandering into a fresh morning with a good dose of eggs and buttered pancakes. 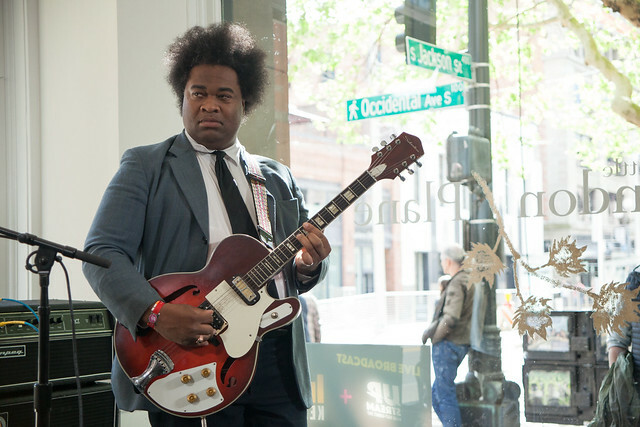 And the band, led by Seattle native and expert guitarist, Jabrille Williams (aka Jimmy James), recently showcased their live chops at Timber! Summer Music Festival, featuring a number of special guests, including Emerald City stalwarts Adra Boo, Josh Rawlings and Evan Flory-Barnes, along with Sharon Jones and the Dap Kings’ vocalists, Saundra Williams and Starr Duncan-Low. But about this time last year, the group experienced a shock. The True Loves parted ways with lead singer, Grace Love. In the months that followed, James and the group put the pieces back together and are playing more and more as an instrumental group in the vein of the Muscle Shoals rhythm section or the famous Motown backing players. In fact, James says The True Loves have no plans in particular to find a new, regular vocalist. “At this time, we’re just going to let it happen as it comes,” he explains. “We’re happy doing what we do.” And what they do is a wonder to witness. Their new record, rich and bold, is catchy and timeless. To learn a bit more about it, we asked James a few questions, beginning with his history in music. I’ve been playing, gosh, since I was 12-years-old. When, or how, did you discover soul and funk music? I’ve been listening to music ever since I was a little kid. The first time I knew I liked guitar was when I heard “My Girl” by the Temptations – that opening guitar line by Robert White – and hearing the guitar lick on “I Second That Emotion” by Smokey Robinson and the Miracles. My musical tastes were very adult for a little kid. I listened to The Mamas & the Papas, Johnny Taylor, Sam Cooke, Aretha Franklin. My mom said she’d hear me singing songs like “Respect” in the back seat of the car when I was four, like, “Just a little bit! Just a little bit!” That’s how big I was into it. I heard you used to carry your guitar around everywhere when you were young. That true? I used to carry it all the time. It was a must-have. I didn’t really care about homework or nothing like that. I didn’t even care about lunch. The guitar was my lunch. The first guitar I ever owned was an acoustic, probably cost about $30. It had these really cheap tuning pegs that broke. Next thing you know, it only had two strings left on it, so I used to play that. My first electric guitar was a Harmony Rocket – kind like a clone of Chuck Berry’s guitar, a little bit. Then I owned a [Fender] Strat[ocaster] later from American music I bought for a real cheap price. That one I still have – the white one I play – I’ve had that ever since I was 15. What was the writing process like for the band on Famous Last Words? Everybody in the band was talking about, “Let’s record, let’s get some new tunes down.” [Drummer] David McGraw would say, “Let’s work on some new stuff!” We wanted to challenge ourselves and challenge each other to come out and write a new tune. For example, [bassist] Bryant [Moore] would write a tune, [trombonist] Jason Cressey would write a tune, or I would write a tune that’s a collaborative effort. Just trying to come up with different stuff than we usually would do. It was a challenge to do instrumentals when most of us were used to playing with singers. We had to fill different spaces. Usually we are kind of staying in the groove and everybody rides it out because the singer is doing the main part. We’re just the canvas holding that together. So now, we have to fill in where the singer’s not – and that will be horns, bass, organ or maybe guitar. Is this new way of writing liberating? It is – it’s different for me. At the same time, I’m kind of like – I can kind of get away with a little more than usual. I can kind of – what’s the word, embellish a little bit more. I can embellish a little bit more because I’m not getting in somebody else’s way. Usually, with a singer, we’d use a lot of restraint. But the band is great with restraint anyway, that’s who we are. It seems like you really do value concision as a writer and as a band. It’s funny; I’ve heard that before. But I’ve never thought about that. I think it’s just more of, you kind of have a building block and you want to keep it as consistent as possible. You want the listener to follow. It’s the same thing with lyrics. If you have a story, you want people to follow you instead of being thrown off the beaten path. I don’t want people to be like, “Oh god, what?” Sometimes that’s cool but I don’t want to constantly lose them. For us being the group that we are, it’s very easy to play because there is no musical or personal ego. That’s the greatest part of it. Playing in the group, either with the True Loves or with [organist] Delvon Lamarr’s band, DLO3 [which James is a member]. I don’t feel egos. We’re here to serve the greater good of the music. I’m glad for this type of group. You hear it so much, so often, it’s more, “Me, me, me.” That’s not what it should be about. It should be about serving the music for the greater good. What’s it like being the frontman for The True Loves now? Okay, here’s the “secret sauce” question – how did you develop your exquisite guitar tone? For my guitar style, I don’t use – very rarely do I use pedals. I’m not big into the pedal boards. I’m not knocking them. Just for me, for my ears and my ears alone, I want to be able to control my guitar from my own self. It’s just straight guitar-into-amp. It’s an easy setup and it allows the greatest control of the instrument, for me. Can you talk to me about your close relationship to the Dap Kings and their music? Let me go back: I was at a friend’s house in Bellingham and there were some CDs around there and I was snooping around a bit to see what kind of record collection they had. And I saw a Sharon Jones and the Dap Kings record, Dap Dippin, their first. I thought this must be from 1964-65 but somebody told me they’re current. I said, “There’s no way in the world there’s a group today that plays like that.” I couldn’t wrap my head around it. My friend said he had a spare ticket and did I want to go see them? They were playing at Chop Suey and I said, “I got to go see this for myself. I don’t believe it!” So I went to the show and they strolled up on stage. I remember it was a hot summer day. And they got up there. They hit the first notes and they started playing an instrumental – this was before Sharon even got on stage. I was star struck after that. So star struck that it took me a while to talk to them. I was so nervous. These guys are stars to me, just like if someone else saw Michael Jackson or Prince. That’s how I felt about them. But once I got to talking to them, once I got bold enough, I got to tell them how much I liked their record. I met Sharon Jones backstage at Chop Suey. I said, “Ms. Jones, I love your music and I really like what you said in the interview [with her, printed in The Stranger that week].” And I repeated some of the parts of the interview back to her. She asked my name and I told her. She said, “You’re too cute, let me give you some sugar.” And I became even more star struck after that. I got to meet them one by one. I started talking to them; they were walking through the crowd. I told them I knew their music so well, the key structures and everything. They said, “Nobody walks up to us knowing our music like that.” As time went on, I became friends with them on social media. They started to learn more about me and I got to learn more about them. I was always interested in their approach. They are, to me, part of this long lineage. Motown, Funk Brothers, Wrecking Crew, The Muscle Shoals band, the rhythm section for Al Green. I thought nothing like that will ever exist again, especially in my generation. My generation is so different. There’s no house bands like that, not really. The people I want to see musically are not around. But they proved me wrong on that one. After that, I was sold on everything they made. I would go out there and find it. I want to ask you a philosophical question: What does the word “love” mean to you? I ask because it’s in the name of your band, in the name of your former singer and you speak about such a familial connection with the musicians you’ve surrounded yourself with. One thing love shouldn’t do, is love should not hurt. Love should never hurt. What love means to me, I guess, it’s encapsulating. It’s like a really – it’s like somebody wrapping their arms around you in cold weather. It can be the coldest it can be outside and somebody’s warmth is encapsulating you to keep you from freezing. That’s what it means to me. And it should be that for anybody. It doesn’t have to be this or that – but it has to mean when I’m frozen or I’m about to turn into an icicle and my own heat can’t keep me going, that’s going to keep me going. That’s how I look at it. It’s like warm arms around me holding tight and not letting go. That’s the best way I can put it. 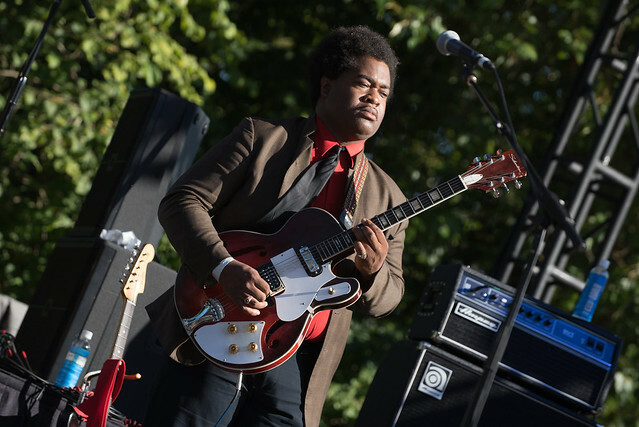 Guitarist Jimmy James of the True Loves and Delvon Lamarr Trio talks about his musical influences, and how music breaks through the language barrier and brings people together. Every week, KEXP features a new local artist with an interview and suggested tracks for where to start. This week, we’re featuring Seattle folk rock outfit The Maldives, who play Concerts at the Mural this Friday, August 25, with Industrial Revelation and Emma Lee Toyoda.